Welders have an immense amount of skill when it comes to working with metal. Welding gloves are an indispensable part of their arsenal. 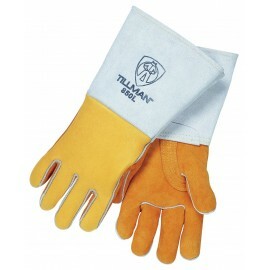 They’re necessary to protect the hands from flying sparks, heat or even flame-ups. Because the nature of every welding project can vary, we carry a number of gloves that can accommodate any welding-related need. From the flexible to heavy-duty gloves, we have what you need to make sure that you safely complete your next welding project. 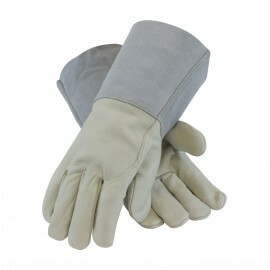 Welding gloves are uniquely designed for different welding processes. There are gloves that are made specifically for MIG (metal inert gas) welding and others that are designed for TIG (tungsten inert gas) welding. Each has its own idiosyncratic features. Since MIG welding causes more sparks, the gloves designed for this process need to be able to defend against sparking. The extra padding that MIG gloves come with make this level of protection possible. TIG gloves are typically lighter and more flexible. 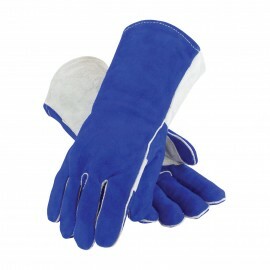 Most welding gloves are constructed of leather or leather-like materials such as pigskin. Many of the full-featured gloves also include options like Kevlar stitching to increase their durability. Enviro Safety Products carries gloves specifically designed for women, too. These gloves are less bulky than those designed for men’s hands. 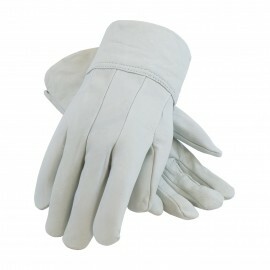 This allows the wearers to make more dexterous movements when fitted with these gloves, and in turn, improve the finished product. How do I know which pair is right for me? When selecting your welding gloves, remember that men and women do not have identically sized hands. Thus, welding gloves that are made for one gender may not work well for the other. Gloves like the AngelFire Women's Stick/Mig welding gloves are specifically designed for women’s hands. 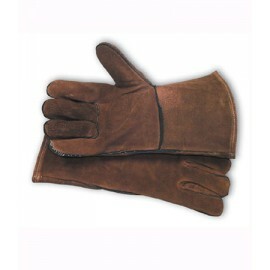 MIG and TIG gloves are intended to have differing fits. 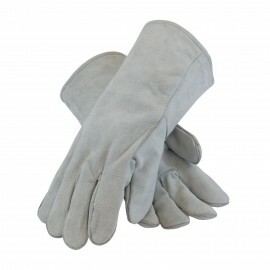 Generally speaking, a MIG glove will have a looser fit so it can be easily removed in the event that it overheats. TIG welding products less sparks, and in turn, the gloves used for this kind of welding are usually tight-fitting and made with more built-in flexibility. 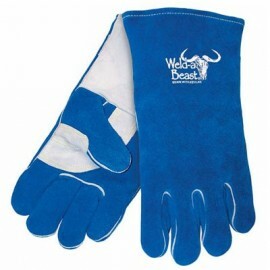 If you do a lot of large-scale welding, you should look into gloves that have added reinforcement. 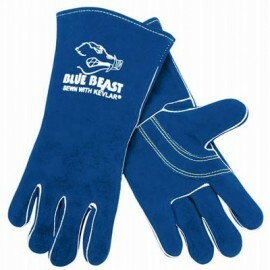 The BSX Vulcan gloves are an excellent example of heavy-duty welding gloves. What kind of materials are welding gloves made of? 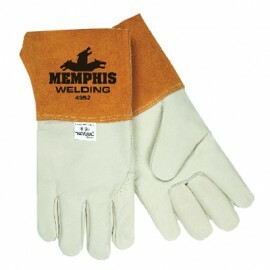 Most welding gloves are made from cowhide or another type of hide. Goatskin, deerskin and pigskin are fairly common substitutes for cowhide. Many gloves are reinforced with Kevlar stitching for added protection and durability. One of the main benefits of a leather-based (or one of the aforementioned substitutes) glove is that it offers excellent breathability, especially when compared to a synthetic material. In terms of properties, cowhide is resilient and able to withstand a fair amount of electrical current when dry. Calfskin isn’t as durable as cowskin, but it does offer more maneuverability. Pigskin is well-balanced and offers flexibility, oil- resistance and quick drying times. 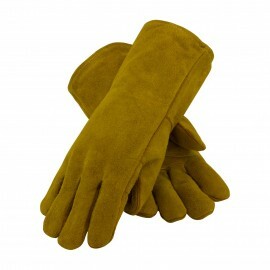 Goatskin gloves are durable-yet-lightweight and because of their thinness, allow for excellent tactile feedback. Deerskin is the thinnest material of all, and as such, lacks toughness. 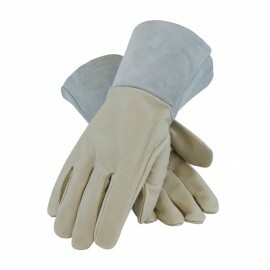 But it can serve as the foundation for an extremely lightweight and flexible glove. It’s important to not overlook the lining inside, either, as it will influence the performance of the glove itself. 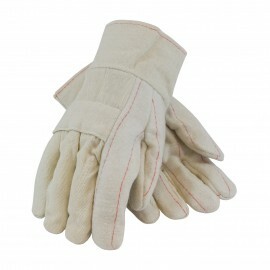 There are welding gloves with no lining to ensure that as much flexibility as possible is retained. 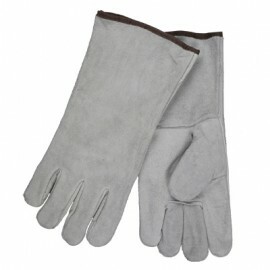 Other gloves are lined with various materials such as wool and Theromsock lining. What are the major differences between different kinds of welding gloves? Aside from their appearance, welders’ gloves have a number of key differences that separate them. One of the most important separators is whether the glove is a MIG or TIG glove. If it is the former, it will typically be loose-fitting, have added padding and be less maneuverable. If it’s the latter, however, it will be tight-fitting, offer limited padding and be quite flexible. As a real-life example of the differences, some people report being able to type with a standard keyboard while wearing TIG gloves. This would be nearly impossible in MIG gloves, many would say. 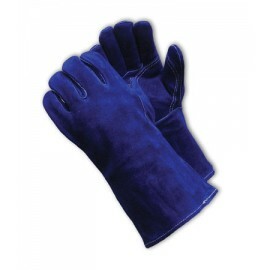 The materials that welding gloves are constructed from also play a role in their characteristics. Stiffer and thicker materials will make for a less maneuverable glove, for example. Should I get fingerless welders gloves? 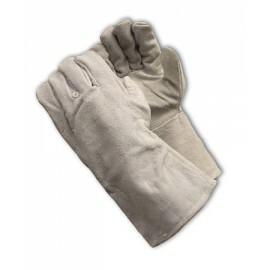 Some people may find themselves drawn to fingerless welding gloves because of the versatility that they offer. 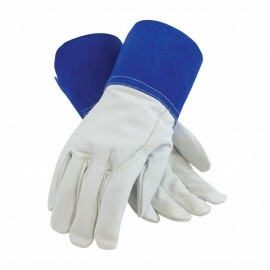 These gloves can give you an unmatched feel for your welds. However, there are some safety risks that you’re taking when you expose your fingertips to a welding torch. 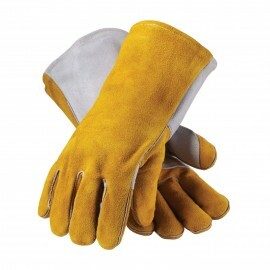 You should avoid using fingerless gloves on projects that will be spark-heavy and dangerous. If you are interested in fingerless gloves, Enviro Safety Products has plenty for you to choose from. Check out the Red Ram Fingerless Welding Gloves from Memphis Gloves for a low-cost fingerless option. 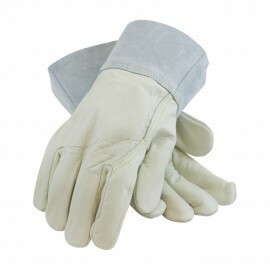 We carry gloves from the most recognized and respected manufacturers in the industry. 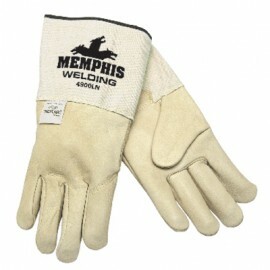 We proudly stock high-quality Memphis Gloves and Revco Industries products, among many other companies. Our selection means that you’ll be able to get your gloves at the lowest possible price. We have all of the colors, sizes and styles you could want. Not only do we carry an amazing collection of welders’ gloves, but we also have additional essential safety gear for welders. As every welder knows, a specially designed helmet makes it possible to get the job done without risking incident. With all of the options out there, however, it can be hard to find something that fits your needs exactly. Fortunately, we carry something for every welder – and we have something for every budget. Our large inventory of welding helmets can be found here. But that’s not all, as we also stock clothing for welders. We have welding jackets, welding sleeves, welding aprons and a host of other clothes and accessories to help you work in complete safety. Don’t risk an injury by not having the correct protective gear. Check out our large of collection of welding clothing for the best products and prices around.